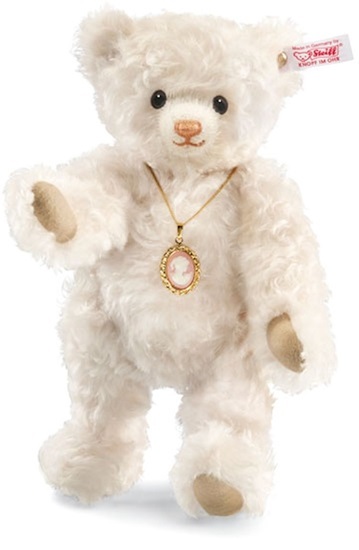 Sure to be a favorite with Teddy Bear lovers everywhere, this adorable little bear is going quick..
We are pleased to snare "Carlotta" from Steiff. She stands 9-inches tall and is made from the finest smokey white mohair. She has black safety eyes, and a hand-stitched nose consisting of caramel floss with pink undertones. Around her neck she proudly wears a genuine cameo medallion based on a historical design. At one point in history, the wearing of a cameo portrait of the ruling monarch showed the wearer´s loyalty to the court. It could also facilitate a quick audience with the ruler and possibly ensure safety and favor. Carlotta Teddy bear is sure to be a favorite with the monarchy. "Carlotta" is 5-way jointed with no sound device. She has a white tag with a gold-plated "button in ear" and is surface washable. She is a limited edition of 1500 pieces.